It’s possible to enjoy the beauty of roses without ever knowing the healing attributes they may contain. Certain varieties contain seed pods, known as rose hips, with human uses ranging from facial astringent to jelly for eating. 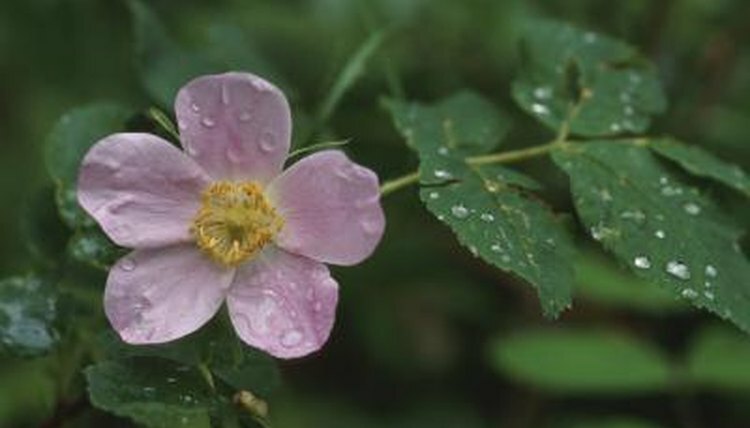 Rose hip supplements are available for horses to treat certain conditions and for general health benefits. If your horse competes, check your sport’s governing body to see if rose hips are a banned substance. Rose hips are well-known for their high Vitamin C content. However, unless your veterinarian specifically recommends that your horse get a Vitamin C supplement for a condition, such as allergies, odds are he doesn't need one. Unlike humans, horses are able to manufacture their vitamin C, so supplementation typically is not necessary. If your horse would benefit from a Vitamin C supplement, consider that rose hips have a high sugar content. You would have to feed him a significant amount to see much nutritional benefit. Humans have long used rose hips to treat arthritis and other conditions without much more than anecdotal evidence of its effectiveness. Research presented by the Osteoarthritis Research Society International at its 2008 World Conference confirms a specific protein in rose hips that protects and perhaps regenerates cartilage. The same study also confirmed that this protein could benefit horses by preventing the onset of osteoarthritis through boosting the immune system, thus protecting joint tissue from damaging substances. Rose hips contain vitamins A, D and E, in addition to antioxidants that support the immune system. However, like Vitamin C, you probably can get better supplementation from other sources with less sugar if you and your vet determine that your horse needs supplementation. These seeds also have Omega-6 essential fatty acids, but your horse likely gets enough Omega-6 from his hay and grain. Adding an additional source could upset the ratio of Omega-6 to Omega-3 fatty acids, and cause inflammation without adding additional Omega-3 to restore the balance. If you over-supplement your horse with Vitamin C, he could get diarrhea, which can be serious in horses. Also, if your horse has laminitis, or any metabolic or insulin-related conditions, you should be concerned about the high sugar content of rose hips. Based on the amount of rose hips your horse would need to see a benefit from any of its health-supporting ingredients, you should compare it to other supplements for overall effectiveness, including cost. Balanced Equine Nutrition: Rosehips, Worth Feeding?